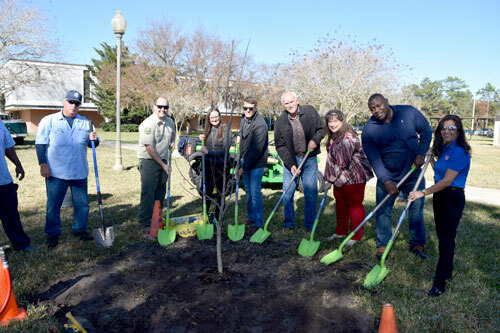 The Palatka Campus of SJR State hosted the 2019 Palatka Arbor Day Celebration in conjunction with the City of Palatka and the Florida Forest Service on Friday, January 18. The celebration included a proclamation by City of Palatka Mayor Terrill Hill and the presentation of the 2019 Tree Friendly Business Award, recognition for a business that has gone above and beyond to enhance Palatka’s tree canopy while undertaking construction projects. The 2019 recipient of the Tree Friendly Business Award was RaceTrac Store #2486 with Pat Davis accepting the award. University of Florida Horticulture Agent Prissy Fletcher educated attendees about proper transplanting techniques during the tree planting ceremony, in which a Tulip Poplar Tree was planted. The tree was one of two donated by the City of Palatka. Also donated was a Swamp Chestnut Oak Tree, which is planned to be planted near the gym. Following the tree planting ceremony, guests were invited to take home native tree species donated by the Florida Forest Service. For a fifth consecutive year, St. Johns River State College received certification as a Tree Campus USA college. To obtain this distinction, SJR State met the five core standards for sustainable campus forestry required by Tree Campus USA, including establishment of a tree advisory committee, evidence of a campus tree-care plan, dedicated annual expenditures for its campus tree program, an Arbor Day observance and the sponsorship of student service-learning projects. The College first obtained its Tree Campus USA status, granted by the Arbor Day Foundation, in 2013 following more than a year of strategically planned efforts by faculty, staff and students. The College’s projects included preserving healthy, attractive and sustainable wooded vegetation on each campus, as well as conducting educational outreach efforts and service projects. For additional information and resources the college provides, visit http://www.sjrstate.edu/treecampus. Pictured left to right at the tree planting ceremony are: SJR State Staff Travis Crumpton and Danny Baggs, Putnam County Forester Andrew Usina, Senior Vice President/General Counsel/Executive Director Palatka Campus Melissa Miller, Palatka Public Works Director Jonathan Griffith, City of Palatka Tree Committee Member Earl Wallace, City of Palatka Interim City Manager/City Clerk Betsy Driggers, Palatka Mayor Terrill Hill, and Pat Davis, recipient of the Tree Friendly Business Award, representing RaceTrac Store #2486.